An EDC (every day carry) knife can be an extremely useful piece of equipment to have on you. You never know when you are going to be in a situation for when you are going to need such a knife, but when you are you are damn thankful you have one. An everyday carry folding knife can be used in a variety of situations from cutting boxes, to preparing food to even being used in a survival situation. Their uses are really endless, but so is a number of products out there on the market. This can make your choice extremely overwhelming when deciding on what the best one for you is, which is why I made this post. Here I attempt to not only go through the basic features you need to look for when looking at getting an everyday carry knife, but also list a few top quality models which I highly recommend for you to get. When you are looking at making your purchase there are a variety of factors you should consider in order to ensure that you get the best model for you. However, these factors are going to be different from person to person, so just because someone (including me) says that a certain knife is great for them, doesn’t mean it will be for you. So I have listed the most important factors to consider in a hierarchical order from most important to least important. D2 Tool Steel: My preferred steel, the D2 is strong as help and can keep a really sharp edge for a long time. You will more commonly find this on the more expensive models but for good reason. The only downside to this steel is that as it is tool steel, it is not as resistant to the elements and therefore if not properly taken care of can easily rust and corrode. The D2 tool steel is also generally one of the stronger metals and is less likely to break on you. 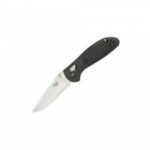 S30v: Another very popular type of steel found on everyday carry knives is the S30V. This steel can get razor sharp (even sharper than the D2). However, I have found that it is harder to sharp and doesn’t keep and edge as long so if they are important features to you, then go with the D2 however if you want the sharpest blade, then go the S30v. Also, as the S30v is stainless steel it is much more resistant to the elements meaning it has less chance of rusting and corroding. 8Cr13MoV: Now this isn’t the best steel out there and is more commonly found on the cheaper models, however, I still find that for the price, that it is a relatively good steel. So if you are looking at not spending that much on your very day carry then go for this model. Another important factor is the style of the blade. 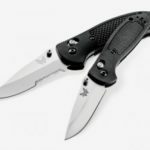 Now this will highly depend on what you are going to be using it for but basically, the two most popular styles are the drop point and the Tanto. A drop point blade has a bigger belly and I find that they are better for slicing, whereas a Tanto styled blade is best for piercing due to it’s reinforced and sharper tip. Another factor to consider here would be whether or not you want the blade to be partially serrated or not. This is good if you find that a lot of the time you will be needing to cut (not slice) through tougher materials as having a serrated edge here will definitely be a big help. 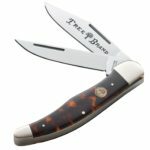 Another important factor you should consider when deciding on the best EDC folding knife would be the hardness of the steel. If you find that you are going to be going for the more heavy duty tasks then you may need to a blade with stronger hardness in order to prevent it from chipping or breaking. However, a higher level of hardness will generally mean more thickness, which means that the edge won’t be as fine. Another important factor you should consider when looking for an everyday carry knife is the type of handle. You want a handle with good ergonomics which allows you to maintain a solid grip. You also want it to be comfortable and allow you to still have a tight hold even when placed under pressure (you don’t want your hand slipping down on the blade). Therefore, I find it best to look for a handle which is made out of G-10 material as I find this is the best for grip even when in the rain. Furthermore, look for one which bends to the shape of your palm as I find these tend to be more maneuverable. As most of the time you are going to want to open your knife easily, you want to look for one which can be opened with one hand. This saves countless amounts of time instead of having to open the knife with both hands. Probably your least important factor to consider would be the color of the blade/handle. This is extremely personal and there are a variety of different styles out there on the market from your basic solid colors (red, blue and green) to even your rainbow and Damascus steel (I recommend you check that out). The following are what we at O&N consider the best 3 overall everyday carries for the average person. 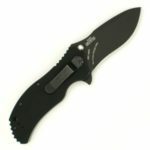 We have tried to include a decent range of prices to show case a knife in everybodys budget. 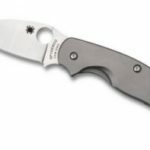 Prices on the knives are current on Amazon as of Feb 2016. 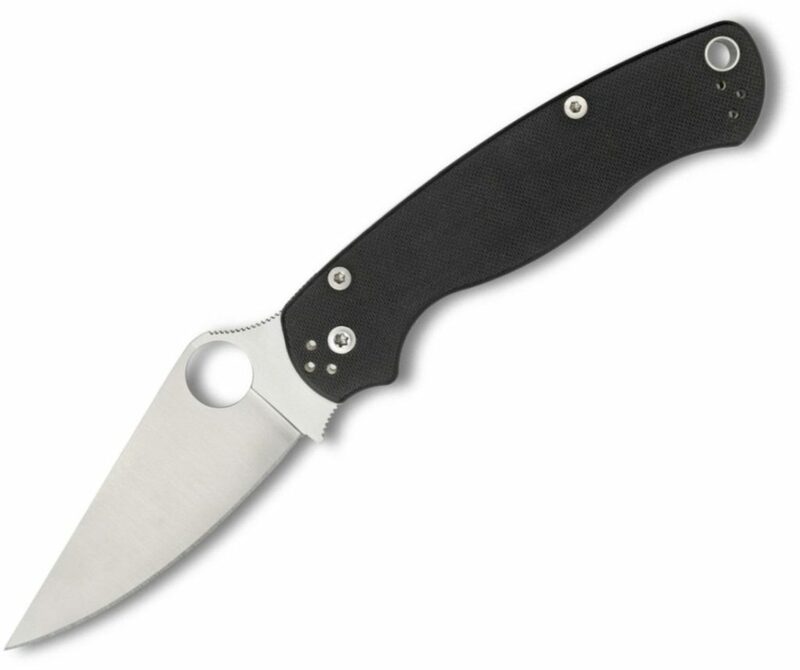 One of my favorite every day carry knives would have to be the Spyderco Paramilitary 2. This blade is top quality and features s30v steel (which if you read above or this post here you would know that this is razor sharp). It is one of the most popular every day carry knives out there on the market and is going to serve you well. There are several different color styles for this knife and if you are not too picky on getting your favorite color you can get this high quality knife for as little as $120. It is easily opened with one hand and the blade is exceptionally good for slicing and cutting. You will find that this knife will solve a lot of your problems and is going to be extremely useful. The thicker blade also means that it is perfect for more heavy duty tasks so if that is what you are in need of then this is your blade. My preferred every day carry knife would definitely have to be the Kershaw Junk Yard Dog II. Firstly, I love Kershaw because of the high-quality knives they produce. Now this is one of their more expensive models coming in at around $85 but is definitely worth the price tag. What I love about this knife is the fact that it uses two types of steel in the blade. What this allows for is that as the majority of the blade is high-quality Sandvik 14C28N steel, it is strong and robust making it perfect to withstand the elements whilst at the same time being strong enough to handle more heavy duty tasks. However, the cutting edge of the blade is made out of my favorite – D2 steel making it incredibly sharp and having a really nice edge retention. Seriously, I barely have to sharpen this knife and I use it a lot day to day. Now this is not the best every day carry knife out there but is an exceptionally high-quality one for the price (around $40). Now don’t get me wrong just because I say that it isn’t the best definitely does not mean that it is the worst. This knife is super high quality and is perfect for the person who just wants a robust every day carry knife for their everyday tasks. It is nothing special but is definitely the best edc for the price you are paying. Overall, the best every day carry folding knife will really come down to personal preference. 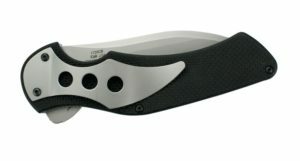 As I stated above my favorite is the Kershaw Junk Yard Dog II as I really think that this is a ripper knife. 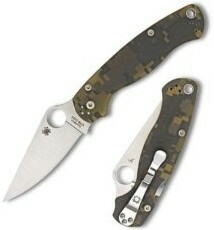 However, you may find that you prefer S30v steel and will, therefore, opt to get the Paramilitary 2. I highly recommend that before you make your purchase however that you go down to your local knife store and check them all out and get a feel for them. This will really allow you to ultimately make the best decision in regards to your every day carry knife. Then once you have made your decision buy it only as you will find it will be much cheaper than in the store. Have an EDC folding knife that you love? Tell us about it in the comments! 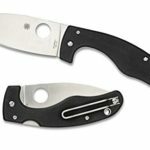 What is the Best Knife Sharpener for a Folding Knife?